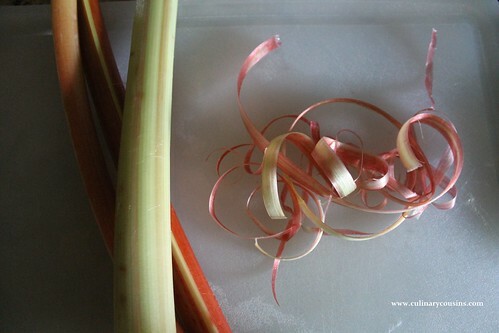 As soon as I saw rhubarb in the grocery store this week, I wanted to see if I could recreate that traditional English dessert. 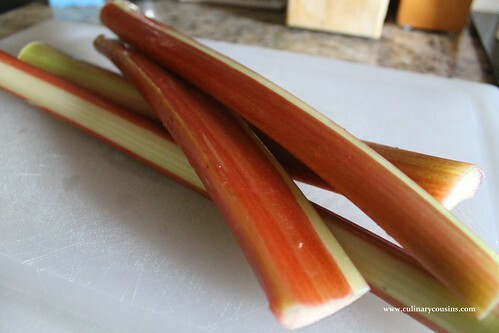 Rhubarb has the consistency of pink celery, and it’s quite tart when cooked. 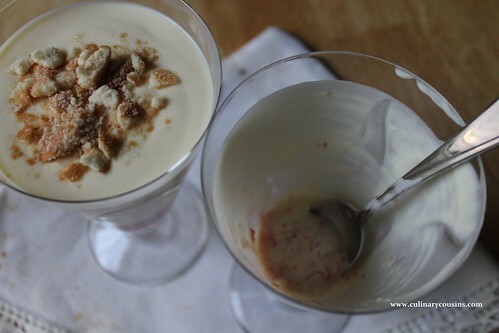 The strawberries are a nice, sweet complement, and the custard just marries the textures perfectly. It’s divine. This is also a great spring/summer dessert, since it makes the best of what’s available in the season, it’s light and not too sweet. 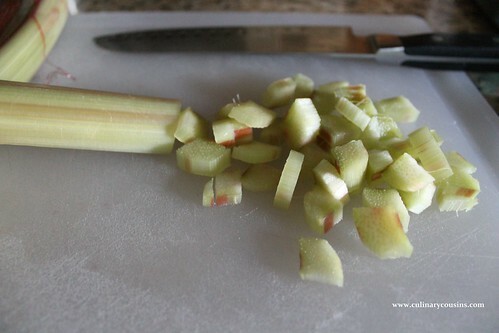 Rinse and peel the rhubarb — peeling it just removes the pink, stringy, thin outer layer. Chop it into 1 inch pieces. 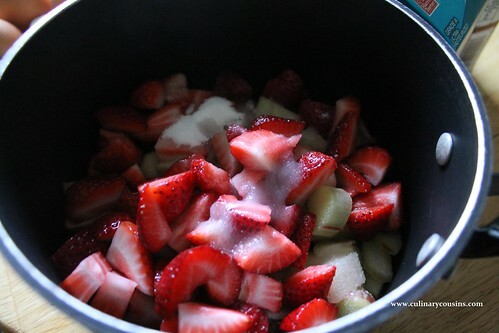 Chop the strawberries, and add all of the fruit to a medium saucepan. Add the sugar and water, and stir everything together. Bring it to a boil, then reduce the heat to medium and let it simmer uncovered for 15 minutes. 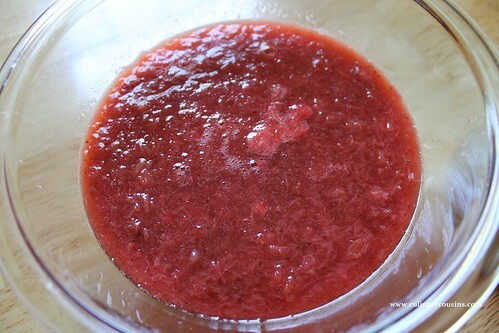 The fruit will all break down and soften, and it will thicken into a jam-like consistency. Pour the fruit into a bowl, let it cool, then refrigerate for a couple of hours, or overnight. Don’t forget to taste it and make sure it’s sweet enough. If not, add sugar, a tablespoon at a time. In a medium saucepan, whisk the egg yolks and 2 tablespoons of sugar until the sugar dissolves and the yolks are light and airy. Add the cream, milk, remaining sugar and vanilla. Whisk everything together so that it is well incorporated. Place the pot on the stove over the low side of medium heat. 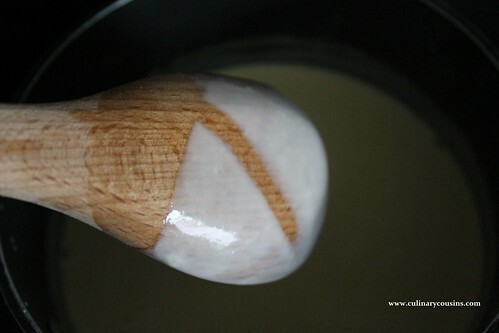 Switch to a wooden spoon, and stir constantly until the mixture starts to steam. Then cook for 15 minutes, stirring constantly. 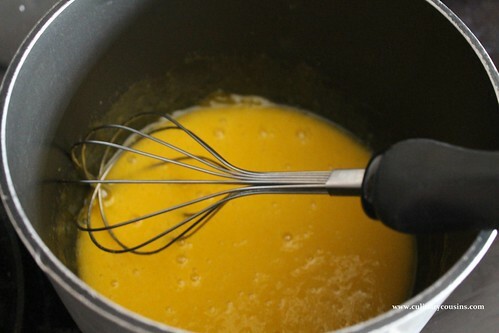 You want to keep the custard moving in the pan so that it doesn’t burn or scramble the eggs. Around 8 minutes in, the magic starts to happen, but keep stirring. After 15 minutes, the custard should have noticeably thickened but still has a smooth consistency. You’ll know it’s ready with the old back-of-the-spoon trick. Dip your spoon into the custard and (carefully, hot!) run your finger through it. Your mark should stay on the spoon without the custard dripping through it. Take the pot off the heat and continue stirring for a minute or two. Pour the custard into a glass bowl. You could strain it if you’re concerned that there might be little pieces of egg. 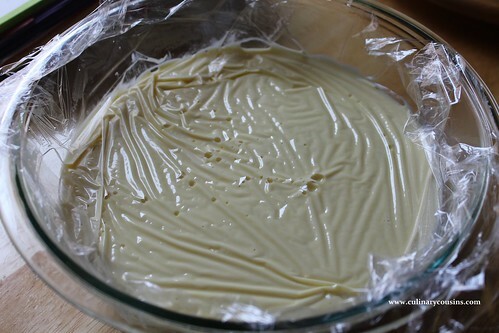 Cover the bowl with plastic wrap, pushing the wrap down onto the surface of the custard. That’s so it won’t form the dreaded “pudding skin” as it cools. Refrigerate for several hours, or overnight. Confession time: the first time I tried this, I completely curdled the eggs. Yes, custard with bits of scrambled egg is grody. That time, I was attempting a “temper the eggs” method, by which you heat the milk separately, then slowly mix the hot milk into the eggs, and eggs back into the milk. Truthfully, there’s so much room for error there, that I like this way. Simple and easy. *Note: this custard would make a great vanilla ice cream base. You could cool it and pour it into your ice cream mixer at this phase for homemade vanilla ice cream! 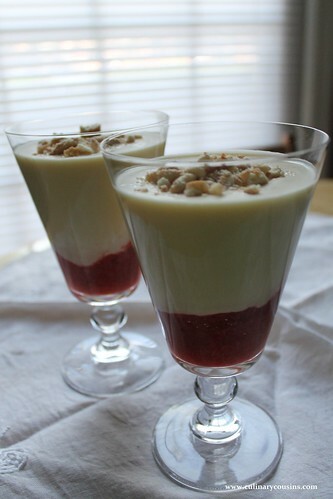 Using a wine glass or a champagne flute or a mason jar — basically any tall glass that will show off your handiwork best — deposit about 2 heaping spoonfuls of the strawberry-rhubarb mixture. Top that with custard. Cover with plastic wrap and refrigerate until you’re ready to serve. These are great “make ahead” desserts at a dinner party. When you’re ready to serve, crumble or crush a few crunchy cookies. I had leftover vanilla wafers, so I used those. But amaretti cookies would be delicious. Gingersnaps would also be interesting. 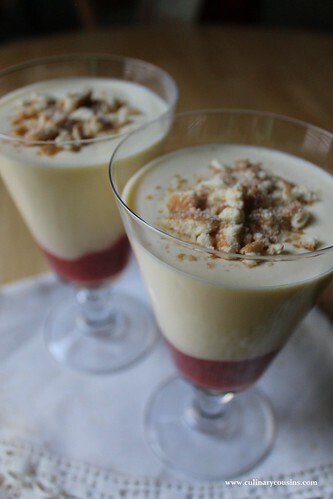 For extra decadence, you could add a layer of whipped cream on top of the custard. Sprinkle with a few of the cookie crumbs, and serve.